Prompted by an increasing number of adverse drug-reaction reports to finasteride, France’s FDA-equivalent agency yesterday issued a letter to 100,000 health professionals reminding them that patients treated with the drug are at risk for developing psychiatric disorders and persistent sexual disorders. 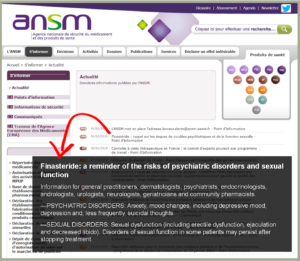 The Agence Nationale de Sécurité du Médicament et des Produits de Santé (ANSM), in conjunction with 17 finasteride manufacturers—including Merck & Co.’s local subsidiary, MSD France—sent its Letter to Health Professionals (English translation here) to general practitioners, dermatologists, psychiatrists, endocrinologists, andrologists, urologists, neurologists, geriatricians and community pharmacists nationwide. In October 2017, ANSM issued its first finasteride warning, noting that “Changes in mood, particularly depression, and suicidal ideation, have been reported by patients taking Propecia.” Additionally, “finasteride treatment should be discontinued in the presence of any psychiatric symptoms,” and that “it is possible to observe persistent sexual disorders after stopping finasteride treatment.